Not much remains of the Romanesque architecture from the 11th century, although cellars in buildings in Old Town Square and Malostranská are often the ground floors of buildings from that time. 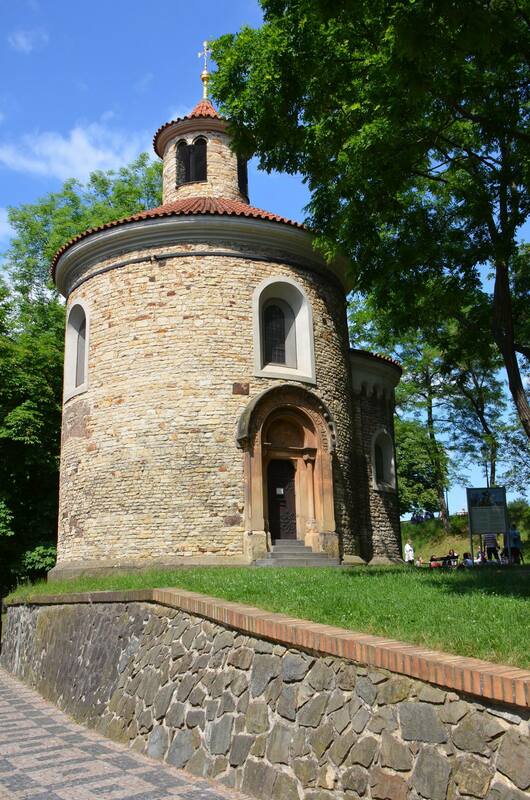 The ground level was raised in the 13th century as a precaution against Prague’s frequent and drastic floods. If you find yourself in a club in a basement that looks really old and has a vaulted ceiling (a ceiling with lots of ribs and arches) you’re probably in what was once a ground floor room of an 11th century merchant’s house. 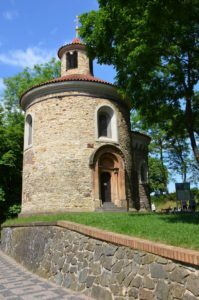 However, three Romanesque rotundas and one Basilica survive from this period: at Vyšehrad, Rotunda of the Holy Rood on Konviktská street, Rotunda of the Holy Cross on Karoliny Svĕtlý street and St George’s Basilica. The foundations from the original 920 building are still visible but the rest of the church was re-built in 1142 after fire destroyed the first building. The tombs of the Premyslids, the founding dynasty of Bohemia, are situated in St George’s Basilica in the main nave. 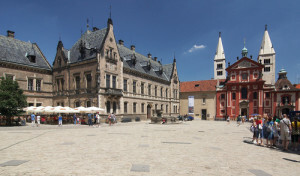 The convent has a permanent exhibition of Bohemian Gothic art and Baroque art which is well worth seeing. 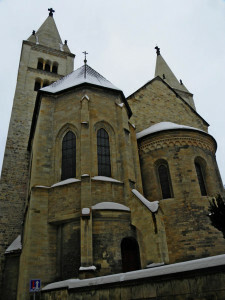 Saint George’s church (Bazilika svatého Jirí), second oldest at Prague Castle, belongs to the most important Czech Romanesque monastic basilici. It was founded in the year 920 and in place of Slovanic services, by which Christianity was spread over the Czech State thus far, a Latin liturgy was used. Two events considerably increased the importance of the church. One of the events was the placing of the relics of the first Czech female Saint, Ludmila, into the church. 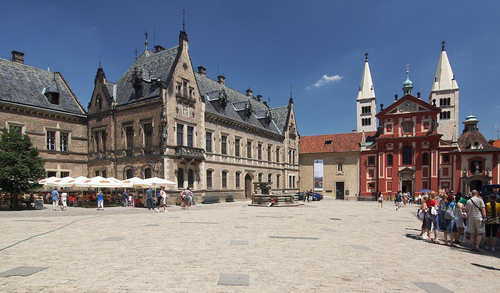 The other event was the founding of the first czech convent by Princess Mlada. During her travels to Rome she acquired approval from the Pope to set up a Prague bishopric and at the same time was consecrated as abbess of the Benedict order and given a crosier. Between the years 965 and 973 monastic buildings were added to Saint George’s Church and then the church itself was enormously rebuilt. The convent was laid to ashes 150 years later, during a military siege of the Castle. Only the tomb of Saint Ludmila remained untouched. A legend about this saint is related to the renewal of the church. The constru ctor Wernher allegedly stole a part of the relics of the saint and took them abroad. Each subsequent who accepted the work is said to have died and in the end Wernher himself too. His son recognized this as a Divine punishment and brought the relics back. Then the work could be finished. Saint George’s Church is a Romanesque basilica with three naves, in which can be observed several temporal elements which were also to be found in the Saxon monastic church in Gernrode. The walls are divided into panels in such a way that it is almost impossible to find a better example of this kind of work. The wall is considered a main artistic element of its architecture. In the side naves and chapels are preserved frescoes, or at least parts of them. For instance in the Virgin Mary chapel there is at the altar a painted Christ with a numbus, the Virgin Mary, John the Evangelist and symbols of the evangelists. At the cross vaults are frescoes representing the celestial Jerusalem. At a vault in the arcade are preserved parts of the painting which represents the psychostasia, that is the weighing of the souls – an angel weighs the souls, pictured as little figures, on a scale. One of the most rare monuments in the chapel is a three-winged relief on the west wall. It is an old romanesque sculpture with influences from Saxon example. It represents the throned Mary, crowned by angels. Also worth attention is the tombstone of St. Ludmila in the Saint Ludmila Chapel (Kaple svaté Ludmily). It is carved out off limestone and is supposed to date from the year 1370. Saint Ludmila was the first female Czech martyr and saint. A sculpture of her body lies on this tombstone. A curiosity of the church, which never escapes the attention of any visitor, is the macabre sculpture of a skeleton, being crowled over by frogs, snakes and lizards. It is nicknamed Brigit. According to the story, an envious sculptor killed his lover and threw her into the brook of the Jelení príkop (Deer Moat). In jail before his execution he portrayed the unfortunate, as she was found. Saint George’s Church contains preserved parts of maybe the oldest stone architecture and, by right, has a lot of admirerors. In the adjacent monastic buildings is an exhibition of ancient art.